Grammy-nominated music legend ‘Uncle’ Charlie Wilson (Photo Credit: Kwaku Alston). 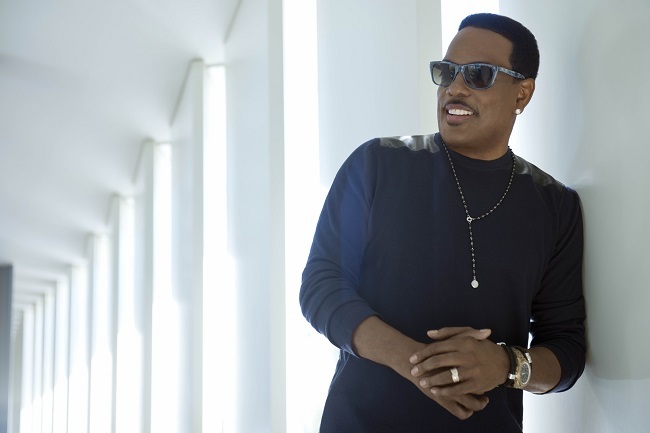 It makes Charlie Wilson happy to see his fans smile and have a good time to his music. The crowd-pleasing elder statesman of R&B and soul music knows he’s put on a good show whenever he can ring his sweaty clothes out or see his adoring concertgoers sing along to his extensive catalog of pulsating funk classics as a member of the Gap Band and current chart topping romantic ballads as a beloved solo artist. Uncle Charlie came back onto the scene as a leader in digital era R&B, consistently dropping an unparalleled canon of heartfelt songs including “Charlie, Last Name Wilson,” “You Are,” “Without You,” “There Goes My Baby,” “Magic,” “Goodnight Kisses” and “My Love Is All I Have.” His second wave of success was initially met with some resistance from record executives and other entertainers who thought Uncle Charlie’s time in the spotlight had expired. Growing up in Tulsa, OK, the entertainer and songwriter synonymous with crooning “shabba-dabba-dwee-dwee-dwee” was inspired to perform by watching his minister father deliver sermons. A pioneer for black music out of the Midwest, The Gap Band was the first band of color to come out of Oklahoma. The musicians rubbed shoulders with rock acts like Leon Russell, The Rolling Stones, KISS and Kansas. To this day when Uncle Charlie is in the studio, he comes up with numerous ideas and records his vocals in one take. Singer/songwriter R. Kelly’s prolific nature is something else that impresses Uncle Charlie. “He’s pregnant with music,” he adds. “He writes five or six songs a day. We were writing four or five ideas and got one song out. He writes whole songs.” Priding himself on hanging with artists who brag on themselves, Kanye West’s professionalism and attention to detail also resonates with Uncle Charlie. Uncle Charlie released his seventh solo LP, Forever Charlie, earlier this year. This past summer, the soul survivor dropped his 256-page memoir, I Am Charlie Wilson. The biography made the New York Times’ Best Sellers list, chronicling the transparent entertainer’s brushes with fame, success, shady business deals, prostate cancer, sibling rivalry, overcoming drug and alcohol addiction, homelessness and revitalizing his musical career. Going through something like having prostate cancer did not stop Uncle Charlie and it doesn’t have to stop you. If you are experiencing symptoms of prostate cancer such as needing to go to the toilet regularly, straining while you pee or feeling like your bladder is not completely empty, you should get this checked out. It will be easier for doctors to find out what the underlying cause it if you are seen to early enough. By looking into a company like Advanced Urology you will be able to find specialists who will make your concerns their main priority. With their help, you can put your mind at ease and help make life a little bit easier. Your health is very important, so putting yourself first in situations like these should be made a priority. A prostate cancer survivor, Uncle Charlie is now a spokesperson for the Prostate Cancer Foundation. He normally speaks before black men and their families about getting tested and treatment options. The performer has also been clean and sober for two decades. Uncle Charlie says maintaining a strong faith involves him relying on constantly praying and believing in his himself. “I have a happy home and everything else is God,” says Wilson.